The 26.72 metre Riva motor yacht Bucephalus has been listed for sale with Fraser. Built in GRP by Italian yard Riva to a design by Officina Italiana Design, Bucephalus was delivered in 2014 as one of the yard’s 86’ Domino models. She can accommodate eight guests in four staterooms comprising a full-beam master suite amidships, two doubles and a twin. All guest cabins have en suite bathrooms while crew quarters can sleep four staff aboard this yacht for sale. There's a large sofa on the aft deck as well as a dining table for guests to enjoy meals al fresco. Meanwhile, the foredeck boasts enormous sun pads with another seating area and table that can be sheltered by a bimini. The main saloon and dinette occupy a bright, open space divided from the steering station by a large TV screen, allowing natural light to flood the area. The interior features Canaletto walnut wood throughout with chocolate leather and white lacquering creating a cosy atmosphere. She is powered by twin 2435hp MTU diesel engines giving her a top speed of 36 knots. 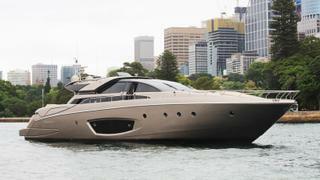 Lying in Sydney, Bucephalus is asking $6,499,000.